Wide receiver remains one of the deeper positions in fantasy football, with plenty of quality waiver options. There is a fair amount of risk involved with any of these players, but as an end of the year pickup that makes sense. Owners that need a little pick up for their week 15 matchup can find a few good receivers right here in the waiver wire picks. It was a nice game for Boyd versus the Browns, but still not the breakout that keeps looking like it is coming. Lockett actually had a better game than most of the Seahawks as their offense was just putrid. Thielen is looking like the favorite receiver for Sam Bradford. I have to admit that I am surprised each week when he puts up yet another useful stat line. He is quietly the number one in Jacksonville, but still available in most leagues. 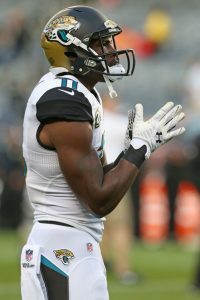 It is clear that Lee is the number one receiver in Jacksonville at this point and he is criminally underowned. He has put up double digit fantasy performances in 4 of his last 6 games and is way ahead of Allen Robinson in targets and production. Against a good Minnesota defense he put up five catches for 113 yards. Teams looking for a playoff boost should grab Lee because he is inexplicably available in most leagues. This would have been a more attractive pickup with Tannehill as the quarterback, but Stills caught a touchdown pass from Matt Moore Sunday. Even with the backup quarterback in the game, Stills is a valuable commodity. He is one of the premier deep threats on the Dolphins roster and has a great matchup coming up. The Jets struggle to stop opposing offenses (except the 49ers) and this game should see some scoring. There is a good possibility that the Dolphins could be playing from behind, so a long touchdown grab is not out of the question for week 15. As I mentioned above I am surprised when Thielen produces, but at this point there is little reason to doubt that it will continue. Bradford looks for him all game long and the Colts are not a difficult matchup. There is a solid chance that Thielen continues his unexpected production and fantasy football teams should take advantage. He is a cheap commodity that should offer a decent return. It is hard to ask for more than that in a playoff waiver wire pickup. It has been an up and down year for Meredith, but it cannot be denied that he has had some big games. He has emerged as the go-to target for Matt Barkley (for what that is worth) and his targets are coming in bunches. Alshon Jeffery is slated to return in week 15, but there is little reason to suspect that Barkley will target him more than Meredith. The Bears face a suspect Packers pass defense and Meredith could be a sneaky flex play for owners with few options.